So politicians sold their constituents a bill of lies to get elected again. Stop the presses, I know. Same old, same old. That is the normal reaction by most people in our republic. The question of the day is, when is enough, enough? In case you hadn't heard, seven Republican senators voted against a "Clean Repeal" of Obamacare on Wednesday in the United States Senate. 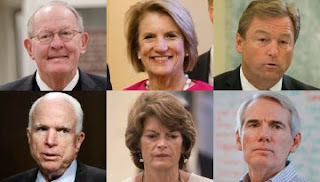 Six of the seven did a flip-flop on repealing the imploding fiasco that is Obamacare. Those six senators are Sen. John McCain of Arizona, Sen. Rob Portman of Ohio, Sen. Lamar Alexander of Tennessee, Sen. Dean Heller of Nevada, Sen. Lisa Murkowski of Alaska, and Sen. Shelley Moore Capito of West Virginia. The seventh senator was Sen. Susan Collins of Maine. She voted against repeal of Obamacare back in 2015 as well.